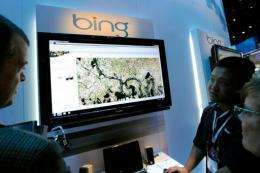 A Microsoft's staff member demonstrates maps using Bing at an exhibition in Las Vegas. A spat between Internet titans heated up with Microsoft angrily denying that Bing copies Google's search results and the world's top online search engine adamant it has proof. A spat between Internet titans heated up with Microsoft angrily denying that Bing copies Google's search results and the world's top online search engine adamant it has proof. Microsoft senior vice president Yusuf Mehdi went on the offensive in a blog post that accused Google of tricking Bing with a "honeypot attack" too sweet to resist. "In simple terms, Google's 'experiment' was rigged to manipulate Bing search results through a type of attack also known as 'click fraud,'" Mehdi said. "That's right, the same type of attack employed by spammers on the Web to trick consumers and produce bogus search results." Google held firm that it conducted a simple, honest experiment that showed Bing copied its search results and that rather than gripe about getting caught it should simply stop doing it. "Some Bing results increasingly look like an incomplete, stale version of Google results -- a cheap imitation," said Amit Singhal, one of the company's search engineers, on Google's official blog. Google had noted that in the summer of 2010 Bing did not return any results for a misspelled search for the surgical eye procedure "tarsorrhaphy." "Later in the summer, Bing started returning our first result to their users without offering the spell correction," Singhal said. "This was very strange." The experiment was repeated with nonsensical searches, including "hiybbprqag," "delhipublicschool40 chdjob," and "juegosdeben1ogrande," which Google had designed to link to a single unrelated result. Google engineers used their company's search engine and Microsoft's Internet Explorer web browsing software to search on the fabricated terms that generated orchestrated results. Within weeks, Bing offered the same results for searches on the made-up terms, according to Singhal. Google equated the experiment to releasing intentionally false information and following its trail. "We do not copy results from any of our competitors," Mehdi said. "Period. "We have some of the best minds in the world at work on search quality and relevance, and for a competitor to accuse any one of these people of such activity is just insulting," he continued. Microsoft argued that search feedback from users of Internet Explorer is "one of more than 1,000 signals" taken into account by its formula to match online queries with results. Bing gets information from users who agree to share anonymous data "as they navigate the web in order to help us improve the experience for all users." Google found it suspicious that a fictional search term and fabricated results popped into Bing if they were just one signal in a sea of more than 1,000 signals considered by Microsoft's ranking software. "However you define copying, the bottom line is, these Bing results came directly from Google," Singhal said in a blog post detailing the sting operation. "To those who have asked what we want out of all this, the answer is simple: we'd like for this practice to stop." Bing corporate vice president Harry Shum dismissed Google's experiment as "a spy-novelesque stunt." "It doesn't accurately portray how we use opt-in customer data as one of many inputs to help improve our user experience," Shum said. "We all learn from our collective customers, and we all should," Shum said. Microsoft has built their company by using technology of other companies. Why should anyone expect its search engine to be different? Obviously they would try to copy the #1 search engine's results. Is there any law stopping them? Google is available to everyone. I'm not saying it is morally correct, but I don't see what Google can do about it. Even Google does a similar thing to Wikipedia (e.g., search for any term and notice that the Wiki article is one of the top 3 results; often the first). I don't know how they do this, but clearly they use Wikipedia articles or search results to bolster their own. Just to click a simple link it steals all of your previous search results and imports tons of excess information that would *NEVER* be needed just to "increase accurate results" bottom line they sell it to marketers. Let's not forget half the time you load bing you are swamped with autoplay adverts with loud noises. Or random empty flashing boxes that move around the screen. (they've cleaned up as of late 2010 but not good enough) The pages are confusing. The java makes the page go unresponsive 10% of every click. The videos need proprietary unnecessary plugins to mine more data. Random saves extra files to desktops etc. It randomly enables linking to facebook and mines yet more data. It's literally an exact copy of google now. Literally. Even looks the same. Old tricks made new again. "Besides the obvious possibility of simple playful mischief, fictitious entries may be composed for other purposes. Chief among these is to catch copyright infringers." Does Googlemaps include "Trap streets"
"Mxyzptlk" backwards will they disappear to the 5th dimension? Bing has not been a big hit and that's due to a late debut. Google shouldn't worry...Bing execs paid for this stunt? MicroCrap stole from Digital Research back in the 1980's so they could get their 'copy' code working! Imagine DR Dos code in MSDOS. Bill did have better marketing skills than Gary (DR) but Gary sure knew his work. Too bad it couldn't have been the other way when IBM stopped by Monterey and Gary was flying his plane so IBM left on their afternoon flight to see Bill...history now...but that's the way it was.